Today’s guest is Bill, who blogs at The Australian Legend. His blog looks at the way literature represents Australians, and at alternatives to the myth of the laconic, independent bushman. Bill dropped out of uni (Engineering) in 1970 to become a truck driver and has never looked back. He has owned trucks, gone broke, driven all round Australia, gone back to uni seven times over 40 years — for degrees in accountancy, logistics and most recently, literature. He currently lives in Perth, WA, where he swims, blogs, drives road trains out into the desert, and does handyman stuff at the homes of his ex-wife and youngest daughter. I could easily have chosen Black Beauty by Anna Sewell, which I read repeatedly as a child, and which when I last read it before making a gift of my old copy to a grandchild, still had the power to make me cry; or Jane Austen’s Pride and Prejudice in which I always find something new; but My Career Goes Bung, published in 1946 but written in 1902, is a special book for me. Franklin wrote it as a “corrective” to the popular view that the very successful My Brilliant Career was autobiography. 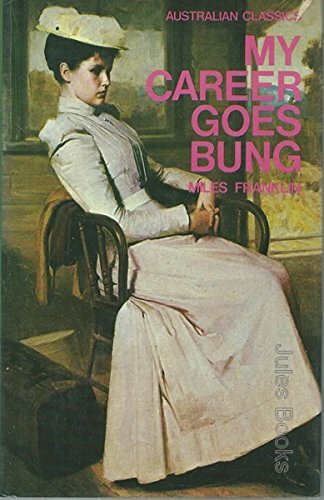 It is cleverly written as the mock autobiography of a mock autobiography writer, and as a (young) adult with some experience of the Sydney literary and suffragist scene, Franklin is much more clearly able to articulate her passionate feminism than in the earlier attempt which she wrote as a teenager. Sadly, her savage portrayals of prominent figures were too easily recognisable and no publisher would touch it. The two books together are stunningly “post-modern” in their questioning of ‘who is the author’ and may have been the stepping-stone to a glittering career. Alas, it was not to be. In the 1990s my then local library, Nunawading, in Melbourne created a special section for early Australian women writers. This arose directly out of the pioneering work of Dale Spender who wrote Writing a New World: Two Centuries of Australian Women Writers (1988) and who was the editor behind the republishing around that time of early Australian women novelists by Pandora and Penguin. So, I was introduced to a whole world of writing which is still largely ignored by Australian literary history. The Bulletin ruled the 1890s with writers like Banjo Paterson, Henry Lawson and Steele Rudd, but in the years immediately prior, in which we are generally told the only writers were Marcus Clarke and Rolf Boldrewood, the most popular and prolific writers were all women – Catherine Helen Spence, Ada Cambridge, Rosa Praed, “Tasma” (Jessie Couvreur), Mary Gaunt, Catherine Martin. 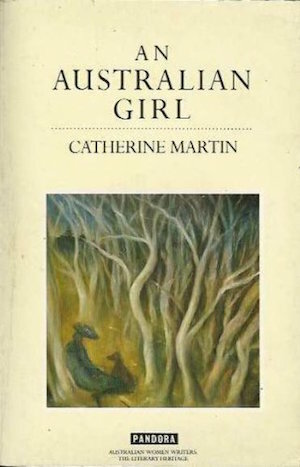 I have selected An Australian Girl (1890) — which is both a story of love gone wrong and a long dissertation on marriage, independence and the beauty of the Australian bush — because it marks the beginning of the reading which led eventually to my M.Litt thesis, The Independent Woman in Australian Literature. Patrick White carried The Pea Pickers with him during WWII because it “reminded him of Australia”. I studied The Pea Pickers, and its sequel White Topee, because its heroines Eve and June – calling themselves Steve and Blue – are the very archetypes of the Independent Woman. But I re-read them because Eve Langley’s is the most beautiful prose in Australian literature. 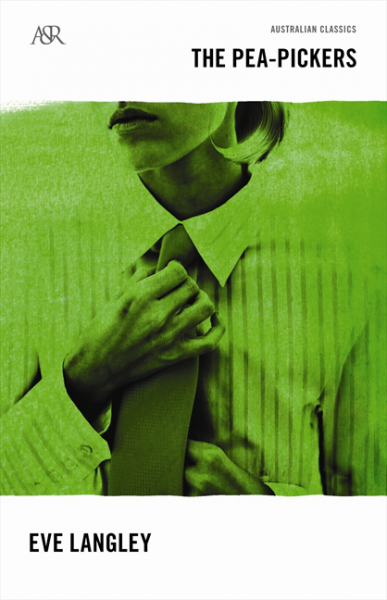 Steve, the narrator, is torn between her need as a woman to find love, and her need as a person and a poet to assert her independence, to be a Lawson-esque lone hand in the Australian bush. The two dress in men’s clothes, not because they are asexual but because that was the only practical way to live as itinerant farm workers in the 1920s. When a police sergeant bails them up for being dressed as men (which was illegal at the time) Steve is defiant: “You ask … are we masquerading as boys. No, we are masquerading as life. We are in search of a country … the promised land …” Their fellows have no doubt they are women – they often dress ironically, mixing items of women’s clothing with their boots and trousers, and in any case are “amply feminine” – and treat them with respect and affection in what is a period of often terrible poverty. 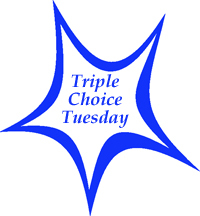 Thanks, Bill, for taking part in my Triple Choice Tuesday! This is such an interesting trio of books, probably the most intriguing selection ever chosen here. The last two are new names to me, but I’ve been able to buy both An Australian Girl by Catherine Martin (who also uses the pseudonym Mrs Alick MacLeod) and The Pea Pickers by Eve Langley on Kindle for £1.99 and £5.99 respectively. I’m looking forward to reading them! What do you think of Bill’s choices? Have you read any of these books? I’m going to have to get my hands on a copy of The Pea Pickers, now. It sounds wonderful! And I love the way his blog challenges me to go back in time to fill the gaps in my reading. Fascinating post – thanks for sharing! Thanks for this Kim. It was fun – and an honour! – to take part. A pleasure also to meet Lisa and the famous Spouse. So happy to hear you met Lisa! We have met in both Melbourne and London (twice now, I think). Learning about Bill was just as interesting as reading about his picks. I have a new blog to follow! The Pea Pickers keeps appearing on best of lists – I recently read Australian Classics by Jane Gleeson (http://bronasbooks.blogspot.com.au/2016/05/australian-classics-by-jane-gleeson.html?m=1) & was amazed by how many well known Australians had it in their top 10. I was intrigued enough to add the book to my TBR pile, now I just have to find time to read it. Bill’s blog is always interesting, pleased to see it highlighted here. I’m also a big fan of The pea pickers and have reviewed it on my blog. I’m fascinated by your 1990s date Bill because it was the late 1980s and early 1990s that got me interested in early Aussie women writers through various books, like Adelaide’s A bibliographic guide, that were coming out then. It was very exciting to discover all those writers. It’s difficult to discover much about the Penguin Australian Women’s Library, but Sue (WG) it includes your Adelaide book and an anthology by Spender, Dale and a collection of C19th writing edited by her sister Lynne and it appears to have commenced publishing in 1988. So, I have Mary Gaunt’s Kirkham’s Find (1897) and CH Spence’s Mr Hogarth’s Will (1865) which were both re-published that year, probably after being absent from the public consciousness (and from Australian literary histories) for 80 or 90 years.